﻿ Chicago Hispanic Newspaper, Lawndale News, Hispanic Bilingual Newspapers, Su Noticiero Bilingue » Need a Passport? April 18, 6523 3:55 pm You are here:Home Local News Need a Passport? 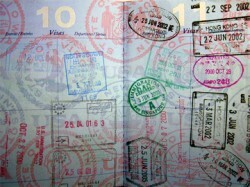 Posted by Editor on October 25, 2012 in Local News | Comments Off on Need a Passport? If travel out of the country is on your agenda and you need a new or renewed passport, the Chicago District will make it quick, easy and convenient to start your trip off on the right foot. Eleven Chicago District stations and branches will hold a passport fair on Saturday, Oct. 27. Customers should bring proper proof of American citizenship and proof of identity. Customers can download a passport application at www.usps.com/passport in advance, but must not sign it. You will be requested to sign in person when paperwork is presented. Customers can also view prices on the website. The list of passport fair locations can be found below. Cardiss Collins Postal Store, 433 W. Harrison 60607, Saturday: 8a.m.-6p.m. Cesar Chavez Station, 1859 S. Ashland 60608, Saturday: 10a.m.-2p.m. Cicero Branch, 2430 S. Laramie 60804, Saturday: 10a.m.-1:45p.m. Grand Crossing Postal Store, 7748 S. Cottage Grove 60619, Saturday: 9a.m.-1:30p.m. Harwood Heights Branch, 7101 W. Gunnison St. 60656, Saturday: 10a.m.-2p.m. Irving Park Station, 3319 N. Cicero 60641, Saturday: 10a.m.-2p.m. John J Buchanan Station, 9308 S. So. Chicago 60617, Saturday: 10a.m.-2p.m. Morgan Park Station, 1805 W. Monterey 60643, Saturday: 10a.m.-2p.m. Niles Branch, 6977 W. Oakton 60714, Saturday: 8:30a.m.-1:30p.m. Norwood Park Station, 6300 W. NW Highway 60631, Saturday: 10a.m.-2p.m. Roberto Clemente Station, 2339 N. California 60647, Saturday: 10a.m.-1p.m. © 6524 Chicago Hispanic Newspaper, Lawndale News, Hispanic Bilingual Newspapers, Su Noticiero Bilingue. All rights reserved. XHTML / CSS Valid.